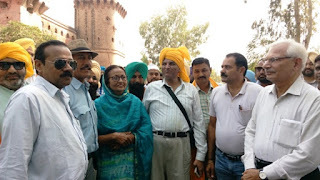 A fresh plea has been filed in Pakistan’s Lahore High Court for early hearing of a case to prove the innocence of legendary freedom fighger Bhagat Singh in the murder case of British police officer, said Imtiaz Rashid Qureshi, Advocate and Chairman Bhagat Singh Memorial Foundation in Pakistan on his maiden visit to Hussainiwala Martyr’s Memorial on 110th birth anniversary of Shaheed Bhagat Singh on September 28, 2017. In 2014, Lahor police provided the copy of the original FIR of the killing of Saunders in 1928 on the court’s order and there is no mention of any name in the First Information Report (FIR) for which he was handed down the death sentence, he said. He further disclosed that the FIR written in Urdu, was registered with the Anarkali police station on December 17, 1928 at 4.30 pm against two 'unknown gunmen'. The case was registered under sections 302, 120 and 109 of Indian Penal Code at Anarkali Police Station in Lahore. Only the height of the person is mentioned as 5’-5” and appears to be Hindu on appearance from the face. Then we decided to file a petition to reopen the case and the first hearing was held on May 13, 2016 in court of Shuzat Ali Khan and the case being of important nature is referred to larger bench. The second hearing in the case took place on February 3, 2016 Chief Justice High Court Lahore Khalid Mehmod Khan before the double bench. We raised the objection that the case cannot be referred to Double Bench because the decision of death sentence was of three judges of British and it may be referred to the five or more constitutional larger judges Bench. Agreeing to our plea, the case was referred to the Chief Justice of Lahore High Court for five judges bench. The third hearing was held on March 3, 2016 before the same Double Bench and on our bring this to the notice of the court, he called the Additional Registrar High Court and this case should be taken to the Chief Justice as I have already recommended the case for larger bench. but despite passing of more than one year, the case has not been heard. Another application for early hearing on September 11 become coming to India under Section 151, has been filed with a request for not working on Just Delayed Justice Denied. He said, special judges of the tribunal handling Singh’s case awarded death sentence to him without hearing the 450 witnesses in the case and his lawyers were not given the opportunity to cross examine them. I will establish Bhagat Singh’s innocence in the Saunders case, he said. He further disclosed that the Black Warrant issued by the Registrar High Court, these three innocent persons are hanged one day before the date mentioned as March 24 1931. He asked as to how the judiciary powers were with the Registrar, Lahore High Court and it proves that all judiciary decision were used to be taken after getting dictation from the British government. He said, the Pakistan judiciary is independent now and don’t take dictation from anyone. The decision of hanging to Bhagat Singh and his association was announced by getting dictation from British government which was totally wrong. He quoted that Pakaistani courts have announced death sentence to one of the Prime Minister and two elected PMs – Gillani and Sharif - were also sent back to home. We are now hopeful that it will be a historical decision in the case of Bhagat Singh by the independent judiciary of Pakistan with the association of Lawyers Mumtaz Moman Malik Advocate and Dr.Nafeez Ahmed Sadiqi. Qureshi said, after the decision in this case, we will file another amended petition to make party in this case of UK government. He pointed out that Malika Victoria on her visit to Jallianwala Bagh had expressed concerned over the death of innocent persons. It will be one of our demands in our petition to ask Victoria to tender apology from India and Pakistan government the family of martyrs and pay them compensation.